With all the potential of splashing water on the catamaran, I’ve always shied away from bringing nicer cameras. I have my waterproof Olympus TG-2, which is my go to water and beach camera. This year, I took a little chance and also brought my Canon G7X Mark II. I used it to make higher quality photos of the family and scenery, including this one. Once we pass a certain point and the sails are unfurled, the wind and speed picks up. I safely tucked the Canon into a plastic ziplock bag. This photo is at a 100mm equivalent, which is the maximum focal length of the Canon. 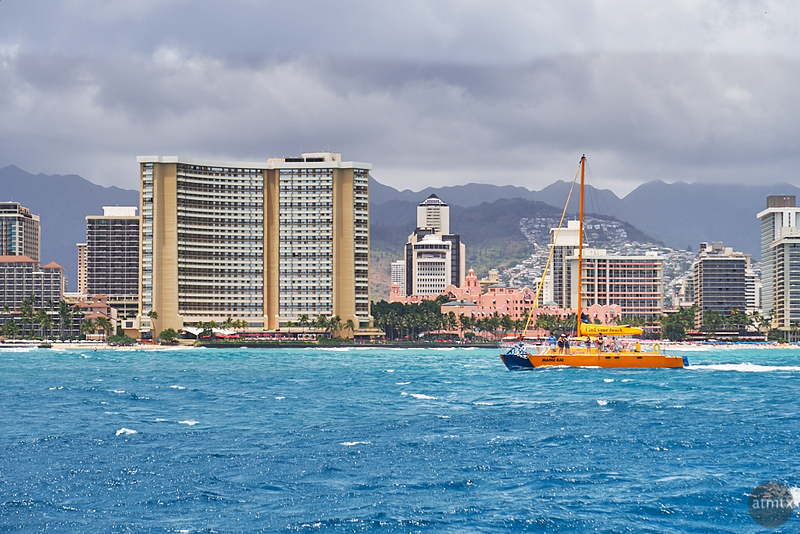 I thought the yellow catamaran made an excellent backdrop to the hotel skyline of Waikiki Beach.